UPDATE: #Drones4Good at IDW2018, we have good and bad news! 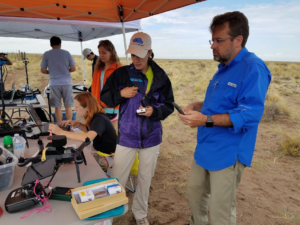 Good news: #Drones4Good is “ON!” For those who are self-funded and already planning to attend International Data Week/SciDataCon, and for the strong local drone user community, we will facilitate a three-day flying event. Bad news: We were unable to find sponsors, so we can’t offer participant travel support, group lodging or catered meals. Flying venue: We will fly at the Khama Rhino Sanctuary, approximately five hours’ drive northeast of Gaborone. Transport: The University of Botswana is sponsoring transportation between Gaborone and the Khama Rhino Reserve. Shuttle busses will depart from the University of Botswana Computer Science department at 12 noon on Tuesday, October 30 and return to Gaborone on Friday, November 2 in the evening. This will allow us to fly on Wednesday, Thursday, and Friday. You’ll have the entire weekend to enjoy the area before IDW begins the following Monday. There are many interesting tourist attractions to explore nearby. Accommodation: If you bring your own drone, it must first pass inspection before we depart from Gaborone. We will facilitate this process on the morning of Tuesday, October 30, so we suggest arriving in Gaborone by the prior Monday. You will need to find accommodation for this night in Gaborone; many travel websites offer a range of options, and IDW recommends a number of local hotels. Khama provides camping, dorms and chalets. For slightly more comfortable options, we recommend either the Serowe Hotel, the WhitePalace in Serowe, or any of the other hotels and guesthouses available in Serowe. As long as you book a place between Serowe and Khama, we will be able to transport you to and from Khama daily (30 min each way). Dining: There are many places to find good food! Khama has a restaurant, and there are others in the Serowe area. Some hotels offer packages with breakfast and dinner, and you can find lunch at local supermarkets in Serowe, or at the Khama Rhino reserve restaurant (near where we will be flying). Piloting licenses: The Civil Aviation Authority Of Botswana (CAAB) requires international drone pilots to apply, in writing, for a permit at least seven days before flying. We are working with CAAB to secure these, but will require all who plan to attend to submit the appropriate forms and other required information by Oct. 15. Complete the Application for Remotely Piloted Aircraft (RPA) Certificate form and return it to: rpas4good@gmail.com. Read a copy of the “Drone Operation Laws, Republic of Botswana,” before submitting the RPA certificate. We will submit everything received by October 15 to the CAAB. Send a certificate of clearance (police background check) from your own local authorities to: rpas4good@gmail.com. Indicate in the same email where you will be staying and if you will need a shuttle between there and Khama. If many people opt for camping, we will book a large group site. Request a seat in the shared transportation to and from Gaborone, and if so, how many drones you will be bringing (so we can arrange sufficient trailer space). Signed indemnification forms may be required by the Khama Rhino Reserve.